Between school on London’s Essex fringes and Birmingham University – in what I suppose must have been a parentally-guided bid to broaden my experience of life, I spent six months clerking for a Japanese investment bank in the City. In those days – we’re talking more than 30 years ago – I had a daily allowance of 75p in Luncheon Vouchers, and as often as not would set off across the Square Mile in search of a shady bench or leafy churchyard where I could enjoy my prawn and mayonnaise sandwich whilst reading a book. 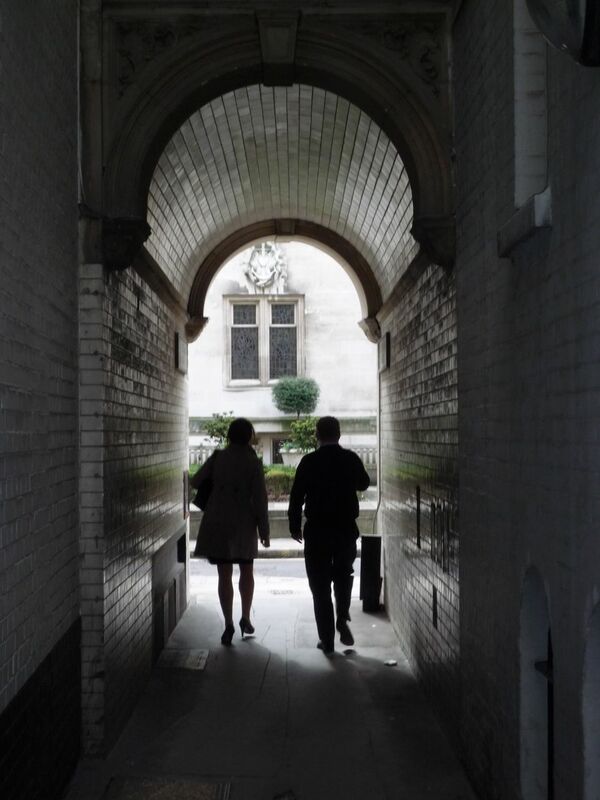 I was, even then, delighted to discover a maze of narrow alleyways and secret places that had somehow survived centuries of change, and soon acquired the habit of spending my lunch hours walking what was essentially still the geography of a vibrant and successful medieval city. ‘Becoming a parent is like blowing up your entire life, and the baby is the best thing lying in the rubble’. So said Lorrie Moore in A Gate at the Stairs… or something along those lines. I would check, but I have a nine-week-old baby boy sleeping in my lap. Anyway, the most exciting East London venue I’ve frequented lately has been Homerton Hospital. I’d heard good things about Homerton’s maternity service – lower c-section rates than other London hospitals, fantastic midwives – and I had a good experience (although my expectations were fairly low, I just wanted to have a baby). I was pretty exhausted by the time I got let in – they don’t admit you to the Delivery Suite until you’re well on the way, a bit like trying to get into an exclusive Soho club, but midwives are on the phone to give advice, and in retrospect it’s best to stay at home for as long as you can – going to hospital won’t make automatically the baby arrive any faster. When we arrived we thought we’d set off a fire alarm, as the room was filled with a low, steady siren. But we soon realised it was coming from a woman lying on the floor, supported by an array of mats, rugs and pillows that had evidently come from the two enormous suitcases her husband had hauled in. It was dead exciting, like an episode of One Born Every Minute, except live. I started off in the new birthing centre, which is very nice: big rooms with en suite bathrooms and huge white bath tubs, gas and air freely available and a brand new reception area where you get welcomed by smiling staff like you’ve just checked in to the Hilton. We did a few laps of the hallways – there was a very hushed, snowy Sunday night atmosphere and the only other soul we saw was a Hasidic Jewish man, who was bent over a book and praying and rocking. However, it quickly became apparent that my natural habitat was the labour ward, with its bleeping machines, hospital beds and powerful opiates. I have to say, the staff were brilliant, and very kind, and swift with pain relief, and compared to what I have heard about other London hospitals I think that is worth keeping in mind when choosing a maternity unit. Don’t be put off by the shabby entrance – you’ll get the same consultants here you’d meet at the Portland, without the 15K price tag (albeit with a few students trailing in their wake, as it’s a teaching hospital). If anyone has bothered to come back after such a long silence, thanks for reading, and come again soon.